Electrochromic "smart windows" is nothing new about these developments mentioned in the "Made us" — for example, here, and here. Researchers from Moscow State University. MV Lomonosov developed its own version of such a device in which the main working substance was a new material — conductive electrochromic poliviologen synthesized in INEOS. To enhance contrast and adherence after passing of electrical oxidation / reduction pair to be used together with low molecular weight conductive dimer aniline. After a careful selection of other auxiliary components electrochromic mixture (electrolyte, thickener, etc.) the researchers were able to achieve good performance. Thus, the device consists of a two conductive glass pumped between electrochromic mixture reversibly changes color in less than a second after the power supply and to maintain its properties after 10,000 of these switches. "On this subject for a while we were working under a contract with the Korean company LG Chem, — Says the rector of Moscow State University, Academician Alexei Khokhlov. — Interesting results have accumulated useful experience. Then working with LG shifted to other issues, but it seemed to us that this area is also quite promising. By the time we have new ideas, developments related to the synthesis of electrochromic polymer compounds and therefore decided to resume the research already under state contract. Check how well these new compounds and try to get those materials and prototype devices that may be of interest to consumers. Including our small businesses ". 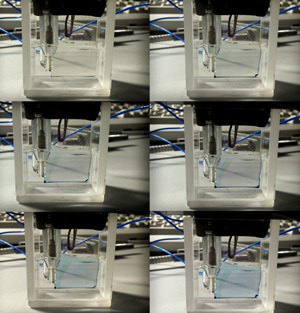 As a result, researchers have been able to get a smart window that can be made of transparent blue after applying a small voltage (about 2). This work was supported by the Ministry of Education and Science of the Russian Federation on the FTP "Research and development on priority directions of scientific-technological complex of Russia for 2007-2012 year"On the" Development of methods for the creation of nano-structured materials for energy-efficient systems on the basis of "smart" devices. " By changing the chemical structure of electrochromic materials, you can make smart windows, switching between multiple colors or even create high-contrast electrochromic displays with a low operating voltage. However, while the Russian researchers have focused on improving the reliability of the main features of its design. Especially that new technology may well be combined with other actively introduce energy-saving solutions. "Smart electrochromic glass and insulating windows can not contradict each other. These are two very different things, — Says Alexei Khokhlov. — Make windows of heat-insulating materials in the cold, and then add to this the same glass layer of electrochromic material — and this is the material at the time of the summer. Included an element of control at the expense of quite a small electric field. So it is possible to combine different approaches. But do not forget about the basic things. I participated in the discussion of energy-saving technologies in the Ministry of Industry. It was winter, it was a question of superconducting power lines, and I noticed that the battery indoors iron, Stalin’s iron battery. I assure you that if you make all the batteries adjustable, save more energy, and the effect is reached faster than that of a superconducting power lines, which, by the way, is still in my dreams. Therefore, offering a high-tech, do not forget basis. Many problems can be solved by simple energy efficiency antiquated methods, and perhaps with it and we should start ". The authors of the project hope that their new development does not become another fantastic high-Tecom, and will finally step into the Stalinist batteries in innovative energy-efficient technologies, which are still many Russian consumers seem as distant and unreal as the main Melbourne skyscraper.